I have been teaching yoga at studios and privately for over two years and practicing pretty much daily for almost 3 years. I have seen amazing benefits and I also enjoy quality craft beer. But there are hurdles that new pratitioners seem to have with getting on the mat for the first time. 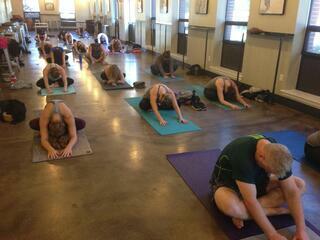 To make it easier for folks to start a practice, I decided to start teaching yoga at breweries as well. I started Taproom Yoga and have been coordinating yoga classes at breweries since the beginning of 2016. Classes begin mid-morning, between 9-11, run anywhere from 60- 75 minutes, and ends with a wonderful reward. And the response has been overwhelmingly great! There are groups of friends who use it to connect, coming from all areas of the state (and even out of state) to meet up have fun. Couples come to practice together and share a beer after. Couples that yoga together stay together I guess? Whole families come as a group to practice together and stick around for a flight after. There have even been yogis that show up to practice and leave meeting friends that use future events as excuses to reconnect. I like to teach an all levels class during yoga at the taproom, but expect it to be challenging. If you’re planning to have a beer after yoga, prepare to work for it. We’ll work on breathing, core, and you may surprise yourself and get into an arm balance…or two. My goal for Taproom Yoga classes is for everyone to have fun. If I can get at least 1 outburst of laughter during my class or a group smile, then I’m happy. Teaching a safe and effective class is a pre-requisite of mine, but my students’ enjoyment of the entire experience is what makes me tick. As a serious teacher and practitioner, do I recommend having a beer after every yoga practice? But once a month won’t hurt and these events are a great way to build a community of friendly folks who love yoga and really love quality craft beer. For a list of breweries that partner with Taproom Yoga, check out our yoga at breweries events page. We’d love to have you!